Sew a diaper bag out of a placemat and some accent fabric! The bag shown was made with a sturdy placemat from Target and offers up a totally unique look as well as being affordable. 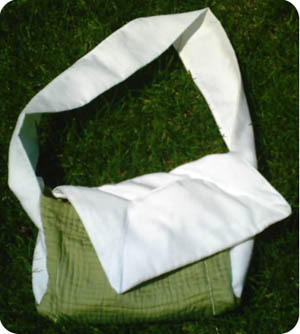 It is a relatively simple process to sew a diaper bag out of a placemat. First, take your accent fabric and cut a long strip. You can decide the width, based on how deep you would like your bag to be (since you're NOT just folding the placemat in half and sewing it into a flat envelope). The wider your strap, the wider the sides of the bag will be . . . which also effects the eventual height of the bag. (Ha, I said this was simple, didn't I?) Before sewing, fold the strip in half (because I'm going to tell you to sew the perimeter and flip it inside out for a clean look) and do a test-fit. Make this strip as long as you want the strap of the bag to be, then add roughly a foot to this measurement (to allow for the bits of the strap that will make up the sides of the bag). The placemat will form the back, bottom, and front of the bag when it's completed. Now that you've figured out the width and length of the strap, fold it in half the long way (wrong side out) and stitch around the perimeter, leaving an open area to flip it right-side out. Top stitch the perimeter for security and looks. Take your placemat and fold it so that it looks like a 'U' shape from the side, with the bottom of the 'U' as wide as your newly finished strap. Fit and pin the strap ends to the three edges on either side of the placemat. Make sure your placemat's wrong side is out. (As with my placemat onbu baby carrier, I skipped the pinning part, just pinched and bartacked.) 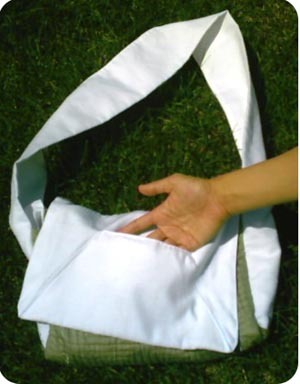 Once you're done stitching, flip your bag right-side out. Now for the flap. Take your accent fabric and cut a long rectangle a little wider than the body of the bag (seam allowance) and three times as long as the height of the bag (or three times the measurement of the height of the 'U'). Fold this in half, making it half as long. Then fold that in half, making it half as wide. Now cut the corner off at an angle, so that when you unfold it once, the (two layered) rectangle resembles a simple drawing of a house (box with a triangle on top), except that the tip of the roof is cut off flat. Make sure that this flat area is wider than your hand, otherwise you won't be able to stick your hand into the pocket after it's sewn. You can actually just do a plain flap (rectangle minus the trapezoid at the top), but I wanted to have an envelope-style pocket on the front of the flap. So, sew around the perimeter of the flap, flip right-side out, and finish by stitching around the perimeter again. Take the trapezoid bit and fold it back towards the body of the flap. Sew the trapezoid down on both sides, creating a pocket which widens at the bottom. Test fit this whole flap against the body of the bag, then sew the back edge of the flap to the back edge of the bag. Where ever the bag might come under stress (i.e. the junction of the straps and body, the tops of the envelope pocket, etc.) be sure to stitch securely. I used the trusty bartack stitch to enforce the connections. Note: My accent fabric was not very thick, hence my double or quadrupling in both tutorials; If you use something stronger when you sew a diaper bag, finish the edges some other way, cutting out a lot of unnecessary steps. Another tip: If you wanted a matching changing pad, use another one of the placemats, find a coordinating vinyl tablecloth to cut up, and sew them together, creating a pad with a waterproof vinyl surface. I hope this gave you some more ideas and got you excited about your table textiles. Good luck, have fun learning to sew a diaper bag out of a placemat! This tutorial was shared with us by Leslie Hing Hing Kung who also wrote up this matching placemat onbu baby carrier tutorial. Thanks, Leslie! Back to the top of the Sew a Diaper Bag from a Placemat page.